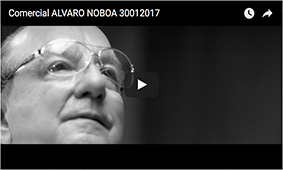 In the past days, Alvaro Noboa has released a video through many TV channels in Ecuador, where he explains his love towards the country. Because I love you Ecuador, I want to end poverty and that everyone has a well paid employment. Because I love you Ecuador, I want to stop delinquency. Because I love you Ecuador, I want you to have an excellent free education. Because I love you Ecuadoir, I want you to have a cement house.